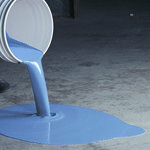 This product is designed to repair or resurface concrete in extremely challenging industrial applications. Apply in areas exposed to thermal shock such as hot and cold wash down areas..
Mortarthane™ HF is breathable like concrete with advanced urethane technology which makes for best choice for the most abusive environments where epoxy's don't hold up very well. Protects concrete, steel plate and water resistant plywood..
@ 70F: Light traffic: 6-8 hours. Pre-measured components in a 5 gal kit for easy application. Components include: 1/2 gal Part A (resin), 1/2 gal Part B (hardener), 45 lbs Part C (aggregate) - volumes and weight approximate. Mortarthane™ HF is approved for shipping to all 50 states by ground or air.